Many households in Eden and South Lakeland are reliant on jobs in the farming and tourism industry, which are often low paid or on zero-hour contracts, and average household incomes are below the national figure. People who struggle financially often turn to high interest lenders for help and end up in more debt. 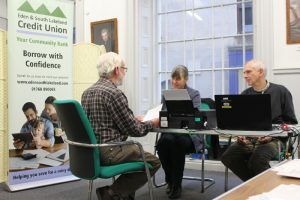 EdenSave Credit Union and South Lakeland Credit Union merged to share resources and be able to support more people who are financially disadvantaged by providing fair loans and a simple way of saving. Eden and South Lakeland Credit Union received £3,000 from the Cumbria Fund and the Russell Armer Fund to establish an outreach office in Kendal town centre. Following a period based at Sandylands Methodist Church, it moved to a more accessible location at Kendal Town Hall in November 2017 and is supported by ten volunteers. The credit union aims to fill the gap between mainstream lenders and high cost finance providers such as pay day loan companies or doorstep lenders. Members who are unable to get credit from the mainstream banks are considered for loans. Currently, the union has more than 600 members who are currently saving more than £400,000 and borrowing approximately £144,000 between them. Doug Elsby, Trustee and Non-Executive Director, said: “The new outreach office, open three days a week, is a forerunner for a planned town centre office in Kendal. Since receiving the funding, Eden and South Lakeland Credit Union has been able to expand, with over 50 volunteers now involved, and service points in Alston, Kendal and Penrith.